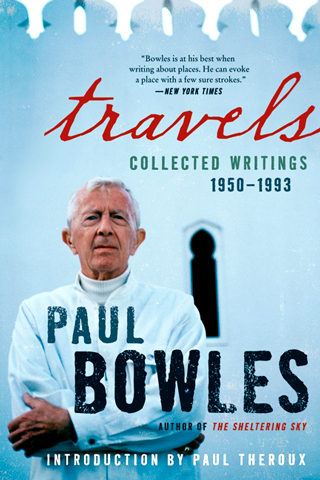 Travels: Collected Writings, 1950–93 (Sort Of Books, London, 2010; Ecco Press / HarperCollins Publishers, New York, 2011), by Paul Bowles; edited by Mark Ellingham, with an introduction by Paul Theroux and a chronology by Daniel Halpern. 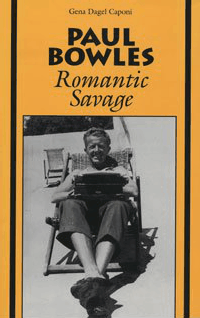 Paul Bowles began travelling the moment he could―leaving America as a teenager to visit Gertrude Stein in Paris. He settled in Morocco after the war, and for thirty years travelled in North Africa, Central America, Southeast Asia, India and Sri Lanka (where he bought an island). 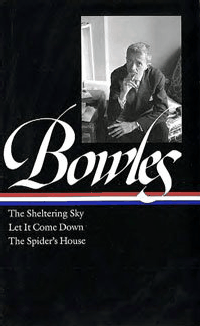 Bowles wrote articles, essays and journals along the way―writing which ranks with his novels in its astute observation, dry wit and impeccable prose. 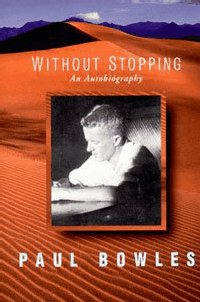 Travels: Collected Writings, 1950–93 brings together for the first time Paul Bowles’s travel writing and journals. 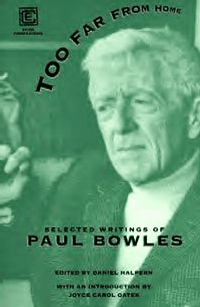 Travels includes the essays Bowles selected for Their Heads are Green along with more than 30 additional pieces, most previously unpublished in book form, accompanied by contemporary photos by and of Paul Bowles. 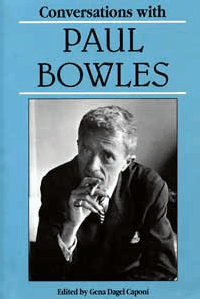 The final piece in the volume, "Paul Bowles: His Life", a remarkable autobiographical prose poem, is published here for the first time. The book also features a new introduction by Paul Theroux and an extensive chronology by Daniel Halpern. 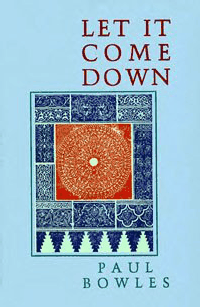 Travels: Collected Writings, 1950–93. Order this book at Amazon UK. Read a book review of Travels: Collected Writings, 1950–93 in The Independent newspaper (London). This book was published by Ecco Press / HarperCollins Publishers and was released in the United States on August 23, 2011. 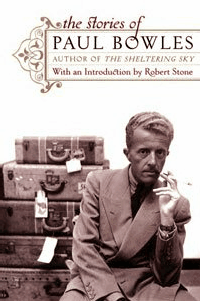 Order Travels: Collected Writings, 1950–93 through Amazon.com in the USA. 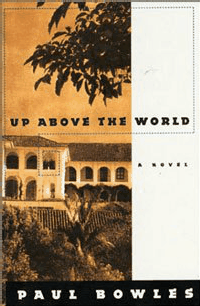 Read the1949 book review by Tennessee Williams of The Sheltering Sky. Read the 1972 book review from The New York Times. 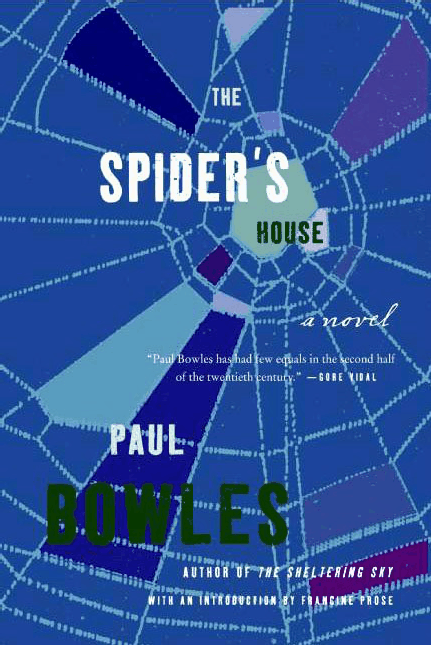 The Spider's House, by Paul Bowles. Buy the paperback edition published in 2006 by Harper Perennial from Amazon.com. 432 pages. 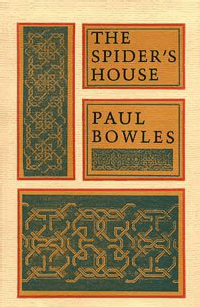 Set in Fès, Morocco, during the 1954 nationalist uprising, The Spider's House is perhaps Bowles's most beautifully subtle novel, richly descriptive of its setting and uncompromising in its characterizations. 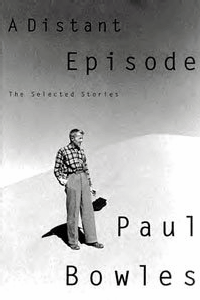 Exploring once again the dilemma of the outsider in an alien society, and the gap in understanding between cultures—recurrent themes of Paul Bowles's writings—The Spider's House is dramatic, brutally honest, and shockingly relevant to today's political situation in the Middle East and elsewhere. 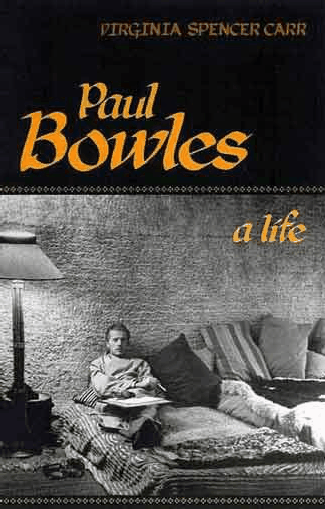 Paul Bowles: A Life was released in England by Peter Owen Publishers on August 24, 2005. 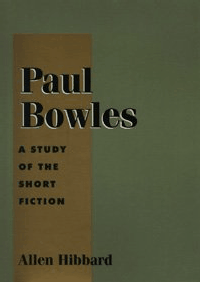 Collected Stories & Later Writings (Library of America) This volume contains 52 short stories written by Paul Bowles. See contents. Read the 1966 book review from The New York Times. Read the 1952 book review from The New York Times. Read the 1955 book review from The New York Times. Read a book review by Jon Carlson. 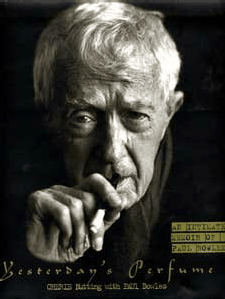 Original photographs of Paul Bowles, made by his friend Cherie Nutting, are available from June Bateman Fine Art Gallery in New York City. "He did not think of himself as a tourist; he was a traveler. The difference is partly one of time, he would explain. Whereas the tourist generally hurries back home at the end of a few weeks or months, the traveler, belonging no more to one place than the next, moves slowly, over periods of years, from one part of the earth to another... another important difference between tourist and traveler is that the former accepts his own civilization without question; not so the traveler, who compares it with the others, and rejects those elements he finds not to his liking...."
Paul Bowles' novel The Sheltering Sky was first published in 1949 and was based partly on his early-1930s travels in the Algerian Sahara. and two subsequent books, A Distant Episode and The Delicate Prey. "In 1931, without any preconceived notion of what I should find there, I paid a visit to Morocco. Two months, I thought, would suffice for seeing the place. And so they would have if what I saw had not awakened a wish to see more, a wish which seemed to grow even as it was being satisfied. At first it expressed itself as a desire to wander over the surface of the land. During that year and the succeeding three years I examined the remote corners of Morocco, Algeria, Tunisia and the northern Sahara, sometimes renting a small house, sometimes being the guest of a Moslem family, but usually spending only a night or two in a room of some establishment that hopefully called itself a hotel, before moving on to the next place. After the War I returned to Morocco and bought a home there. This time I became aware of the fact that it was not the landscape I wanted to know, but the people. A Distant Episode and The Delicate Prey are products of the earlier period; they date from 1945 and 1948 respectively. There is some reason for my taking a defensive attitude in discussing these two tales. I still live in Morocco and have many Moslem friends. The few of these who have read them do not think highly of them. It is easy to understand why, since they seem to go out of their way to present the Moslems in an unflattering light. 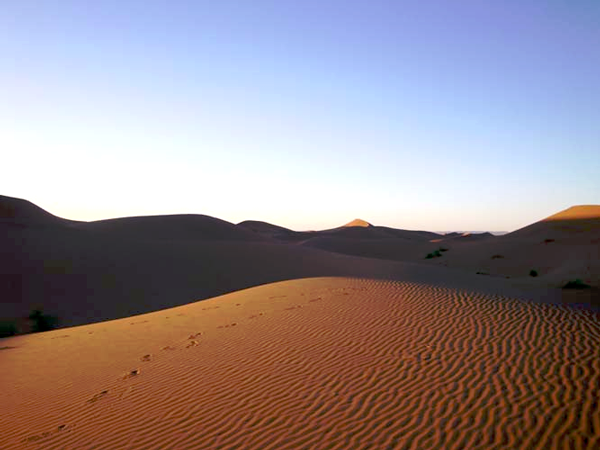 The fact that both tales are based on actual occurrences is beside the point; every story has to come from somewhere, inside or outside, and these two happened to come out of conversations I had with people in the Sahara. Even if I had invented them wholly, instead of only stumbling upon the nucleus of each tale, their truth or lack of it would still have to be gauged according to other than factual criteria, since primarily they are tales not about human beings, but about a place. The place is the Sahara, synonym of emptiness, silence and death, a region whose impact upon the senses and imagination is clearly expressed in terms of inhuman and brutal behavior. The Moslems consider writing to be a means of influencing opinions. Thus to them such an approach is an immoral one because it presents atypical behavior. But even they, when they tell their own tales to one another, stress the extraordinary, rather than the usual." 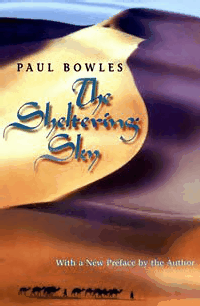 The Sheltering Sky, Paul Bowles' most famous novel, was first published in 1949 in England. 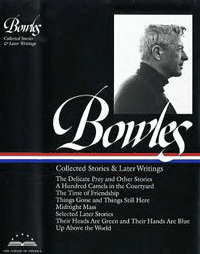 Bowles' book immediately became a best-seller when it was published in the United States, and it is now considered a classic work of literary fiction. You can read the review written by Tennessee Williams in 1949 from the archives of The New York Times by clicking the link below (registration or subscription may be required).